Who is Fereydoun Abbasi-Davani, the new head of Iran’s Atomic Energy Organization (AEOI) and Vice President of Iran? Abbasi-Davani has assumed a prominent role this week in Vienna discussing Iran’s nuclear program and safety issues at the International Atomic Energy Agency (IAEA) conference on nuclear safety. 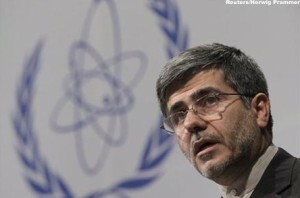 p> During the nuclear safety conference on Tuesday, Abbasi-Davani announced at a press conference that Iran would be open to building uranium enrichment plants and selling low enriched uranium (LEU) to other countries under IAEA safeguard, and would advise countries about nuclear power plant building contracts. He said he had no particular country in mind for this cooperation. But given the United Nations sanctions calling on Iran to suspend enrichment, his remarks were seen more for their defiance than Iran’s ability to export LEU or a gas centrifuge plant for civilian purposes. p> Just what is Abbasi-Davani’s background and what are his plans for Iran’s nuclear program? The fact that he was wounded in a November 2010 assassination attempt in Tehran has increased interest in his role in steering Iran’s nuclear program. Does he favor Iran acquiring nuclear weapons? p> Abbasi-Davani has not shown any sign that he will be more compromising with the IAEA than his predecessors as new head of the AEOI. He has already sparked a defiant note with the IAEA by instituting an important technical step that will significantly shorten the time Iran needs to make enough weapon-grade uranium for a nuclear weapon. In response to a letter from Yukiya Amano, Director General of the IAEA, in which Amano repeated the IAEA’s “concerns about the possible military dimensions” of Iran’s program, Abbasi-Davani announced to the media, “We will respond to the agency by stepping up our efforts in the area of nuclear expertise and technology…we will transfer the 20 percent enrichment to the Fordo nuclear site under the supervision of the agency and will triple our production [of 19.75 percent LEU] during the current year.” Within a year after starting this production at the fortified Fordow facility (which is situated under 90 meters of mountain), Iran would have enough 19.75 percent LEU to further enrich quickly to make enough weapon-grade uranium for a nuclear explosive device. Using 1,200 advanced centrifuges, Iran could transform the 19.75 percent LEU into sufficient weapon-grade uranium in three months. p> Abbasi-Davani has regularly been linked to Iran’s efforts to make the nuclear weapon itself, a process called weaponization. According to an expert close to the IAEA, Abbasi-Davani was a key scientist in the Iranian covert nuclear weapons program headed by Mohsen Fakhrizadeh, a strong supporter of Iran’s nuclear weapons program. Abbasi-Davani personally directed work to calculate the yield of a nuclear weapon as well as work on high energy neutron sources, this expert added. p> He was an early addition to the United Nations sanctions list under Security Council resolution 1747 in 2007 as a person “involved in nuclear or ballistic missile activities.” These sanctions restrict his travel and impose an asset freeze on any international holdings. He was subsequently named under European Union sanctions. Although the Security Council did not provide the exact reason for his being added to the sanctions list, according to the expert close to the IAEA, his involvement in the Iranian nuclear program, including its military dimensions, led to his sanctioning. p> Prior to his appointment as AEOI head, he chaired the physics department at Tehran’s Imam Hossein University, which is linked to the Iranian Revolutionary Guard Corps (IRGC) and work on nuclear weaponization. Abbasi-Davani has also reportedly worked at Shahid Beheshti University, sanctioned by the European Union for associations with Iran’s missile and nuclear programs. p> Abbasi-Davani’s name has been associated with the Iranian Nuclear Society which was previously called Iran’s Coordination Committee for nuclear specialists, allegedly founded by the Ministry of Defence to employ university professors and scientists in defense projects. Abbasi-Davani was a deputy chair of that society. p> The IAEA has information that Abbasi-Davani was the head of the Institute of Applied Physics (IAP), which was a follow-on organization to the Physics Research Center. Both of these organizations acted as fronts for scientific work on a possible Iranian nuclear weapons program. p> According to information provided by an IAEA member state in 2008, an Institute of Applied Physics was interested in an advanced neutron initiator for a nuclear weapon. There could have been more than one IAP in Iran, and ISIS could not confirm that this is the same IAP that Abbasi-Davani headed. These initiators are used to create a spurt of neutrons that can initiate the chain reaction in a core of weapon-grade uranium, leading to a nuclear explosion. It involves a uranium deuteride pellet placed at the center of a nuclear implosion device. Under intense compression from high explosives, this initiator creates neutrons through the fusion of deuterium. These neutrons then initiate the chain reaction and cause a nuclear explosion. p> An internal 2007 Iranian document by a group of Iranian scientists working under an organization headed by Fakrizadeh entitled Outlook for special neutron-related activities over the next 4 years, lays out a four-year plan to develop a uranium deuteride neutron initiator. Part of the less sensitive work of the neutron group was proposed to be done in conjunction with Shaheed Beheshti University, which already was cooperating with the Institute of Physics and was seen as a reliable partner. p> Link to A.Q. Khan? p> Some of Abbasi-Davani’s publications have a Pakistani connection. One of his papers was presented in 2001 at the A.Q. Khan Materials Symposium. p> Abbasi-Davani has also been a participant in the IAEA’s SESAME technical cooperation project, based in Alaan, Jordan. SESAME (Synchrotronlight for Experimental Science and Applications in the Middle East) is the first Middle Eastern synchrotron facility. SESAME opened its doors in November 2008 as a collaborative effort to promote peace through international scientific cooperation. Abbasi-Davani’s involvement with SESAME is surely of a civil nuclear nature. p> Abbasi-Davani is not a traditional pick to head the AEOI. He has an extensive scientific background more suited to researching nuclear weapons than building nuclear power reactors and uranium enrichment plants purportedly for civil uses. What he will contribute to Iran’s nuclear effort remains uncertain. p> His background with the IGRC and nuclear weaponization raises the question that his appointment by President Ahmadinejad aims to accomplish Iran’s final push to a robust nuclear weapons capability. Such a capability would not be a passive or relatively benign enrichment or plutonium production capability that many advanced states, such as Japan, possess. It would, rather, be a capability that would put Iran within quick reach of producing a nuclear explosive. To realize this objective, Iran requires progress on two fronts. First, Iran needs to be able to quickly make weapon-grade uranium in a secret enrichment plant or one hardened against air strikes, such as the Fordow site. Second, Iran needs to be able to rapidly assemble at least a crude nuclear explosive device sufficient for testing and crossing the nuclear threshold. As in the case of South Africa, Pakistan, and North Korea, Iran is likely to view the possession of a crude nuclear weapon as sufficient if it wants to cross the threshold. The ability to reliably deliver a warhead on a missile would be better, but that capability can come later, as it did with other countries that had already crossed the weapons threshold. p> Abbasi-Davani has already taken Iran in the direction of this decision. Once Iran has this threshold capability, the nuclear technocrats in the AEOI and military industries could present this to the Supreme Leader. Would such a capability be too tempting to resist and inspire the regime to make a political decision to make nuclear weapons? p> 2The “neutron group” was reportedly located at the Center for Preparedness under the Field of Expansion and Deployment of Advanced Technologies (FEDAT), which was headed by Fakhrizadeh. An Institute for Applied Physics is also listed as having a neutron group under FEDAT. For more information on this hierarchy, see: Documents Assessing the Organizational Structure of FEDAT, released by ISIS and The Times of London in December 2009.